A Comprehensive Review of the Dr. Scholl’s Foot Spa – Is the Dr. Scholl’s Foot Spa the One for You? Getting the best foot soak is a great way to relieve your tired feet from a long day of walking. The good thing is, you can now do this without having to spend too much money in order to feel relaxed and revitalized. By using Dr. Scholl’s Invigorating Pedicure Foot Spa, you will enjoy similar features from high-end foot spas within the comforts of your own home. In this article, we will show you Dr. Scholl’s foot spa reviews to help you decide whether this is the perfect product for you. What is the Dr. Scholl’s Foot Spa? 1 What is the Dr. Scholl’s Foot Spa? 2 Who is behind the creation of this product? The Dr. Scholl’s foot spa is a soothing foot massager that includes a pedicure system so that you can enjoy an overall foot care experience. Using it is easy— all you have to do is fill it with hot water and allow the product to do its job of maintaining the heat. Who is behind the creation of this product? This foot spa was created by the American company Dr. Scholl’s, which was named after its founder, podiatrist Dr. William Scholl. The company specializes in footwear and other foot care products and has been one of the most well-known companies that provide foot-related products. Can be used with hot water alone, but it also works great when used with oils and bath salts for a more improved spa experience. If you do plan to use some salts, be sure to clean the product thoroughly as leftover salt can block the area where bubbles come out. The vibrations give a good massage and are not too loud or distracting. This produces bubbles that provide added relaxation. It does not heat up lukewarm or cold water. You have to pour in hot water and the machine maintains this warmth for about 20 minutes. It is noted that going beyond the suggested time frame could damage the motor. The product can be used by both men and women, but people with bigger feet might find it uncomfortable and unrelaxing. The heating feature works together with the bubbles, which means that they function simultaneously. There is no option to use only the heater or only the bubbles, which can be very inconvenient to some. This foot spa was made for those who want an affordable product that can still do the job of keeping their tired feet pampered at a reasonable amount of time. If you are expecting a device that has a heating function to warm up cold water, then this is not the right product for you. The machine is unisex, but it is ideal for those with a foot size of less than 13. Soaking your tired feet in warm water is a great way to feel relaxed after a stressful day. This machine features a SMART heater that does a good job of keeping your feet warm enough for as long as 20 minutes. This product has a rolling massager at the middle to give your tired feet a relaxing massage. It also has bubbles that operate with the heater, which are more soothing and light as compared to water jets used by other foot spa products. This foot spa features an acunode basin that has small bumps where you can rest your soles on to relieve any pain and tension. A 5-piece pedicure set is provided in case you want to pamper your nails, and a pumice stone can be installed in the device to soften your heels. 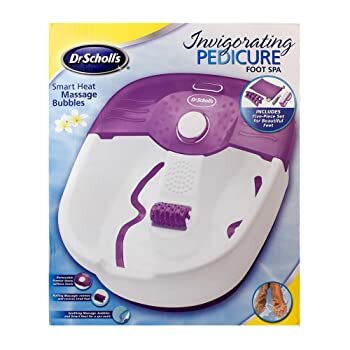 The Dr. Scholl’s Pedicure Foot Spa is a product that offers great value for people who need a quick and effective method of massaging and soaking tired feet. It also comes with other accessories to improve your home foot care experience. The device is a simple foot massager and soaking machine, so be sure not to make any unrealistic expectations. It does a great job of giving your foot a relaxing bath at a very affordable price. The heating feature could use a little more improvement in case other people want to keep their feet warm for longer than 20 minutes. They might also want to consider getting bigger basins for people with larger feet. Other than that, this foot spa product is a great choice for people who want a simple and easy-to-operate device that can keep their feet relaxed.